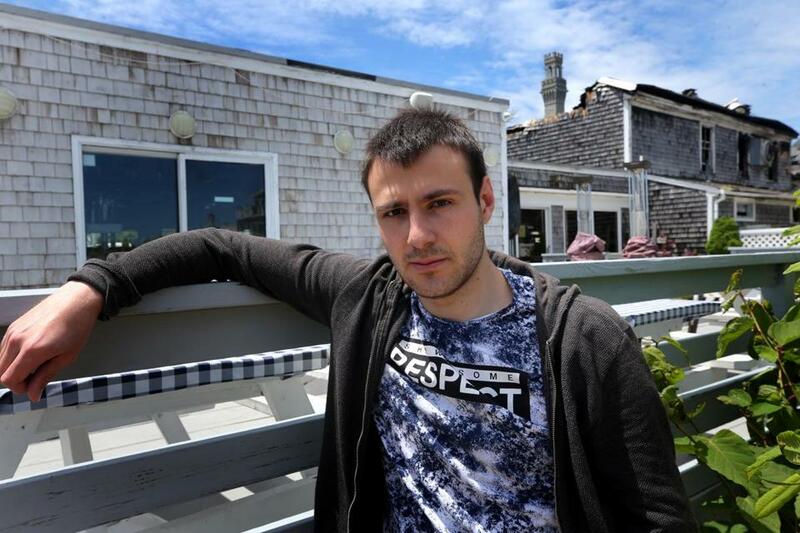 Stoyan Georgiev traveled more than 4,500 miles to work on Cape Cod for the summer. When he arrived, he found the place he was employed had closed due to a fire. PROVINCETOWN -- He had dreamed of this day for a year, saving his money and securing a job as he wondered about life in the summer on Cape Cod. What are the people like? How warm is the weather? What adventures lie ahead? He’s 19 years old, a university student and the only child of blue-collar parents who raised him at the edge of the Black Sea in Bulgaria. “I’m the guy who never left Burgas,’’ Stoyan Georgiev told me this week, referring to his country’s fourth largest city, where he said goodbye to his parents late last month and boarded a plane that would take him to Paris and then on to Boston. Two weeks ago, as his flight began its descent into Logan International Airport, he could never have imagined what was about to happen in this seaside town, where firefighters tried unsuccessfully to save the restaurant where he had found a job. As the plane circled Boston, he was still full of anticipation and the nervous energy that accompanied the fulfillment of a promise he’d made to his mom and dad last summer. And as he cleared customs at Logan and walked out into the Boston evening, the kid whose impression of the US had been formed largely by Hollywood movie-makers nearly had to pinch himself. I’m here, he told himself. I’ve made it to the United States of America. And then the car that carried him here for a summertime of work — courtesy of the J-1 visa summer work and travel program that each year funnels hundreds of young men and women here for seasonal jobs — pulled into the place here where he had arranged to stay with a friend from Bulgaria. His friend, who was supposed to be at work at that hour, was instead waiting for him at the door. Fire hoses were still attached to hydrants, pouring water into what was left of the restaurants at the foot of MacMillan Pier on Commercial Street, including the Surf Club, where Stoyan Georgiev had secured a job as a server assistant. He was 4,700 miles from home. He needed a Plan B. And he needed to send a delicate message back to his already anxious parents in Burgas. Then Stoyan Georgiev did something that – and here I’ll speak for myself – I simply would not have been capable of as a 19-year-old. He kept his calm. He got some rest. He scoured social media. He looked forward. And then he discovered something wonderful. His new friends in the United States, people he’d never met before, were rallying around him and other newly unemployed people like him. The fire had been devastating; some three dozen out of work. But they would make something good come of it. They would not let it rob the summer of a lifetime from young men and women who’d come to the United States in search of jobs, money, adventure, and friendship. So Latasa-Nicks and his husband, Steven, opened their place last week for a “pop-up job fair’’ sponsored by the Provincetown Business Guild. Nearly a dozen employers showed up, owners of restaurants, window cleaning firms, dry cleaning shops, and hotels. They lined up on one side of the room. Displaced workers, including nervous young men and women from Eastern Europe – some of them teenagers like Stoyan Georgiev – lined up on the other. Introductions were made. A spreadsheet was developed. Needs were assessed. Somebody had lost $80 Nike sneakers in the fire and someone else lost $140 eyeglasses. A GoFundMe account quickly raised $17,000. When it was all over, hands were shaken, deals were made. And the panic-stricken young men and women from overseas felt anxiety wash away. And that’s how Fred Latasa-Nicks became Georgiev’s employer — and summertime life-saver. There is a disarming charm about Stoyan Georgiev. His English is polished, nearly perfect. He has an easy smile and an enthusiasm that makes it difficult to believe that he was just a few days from crushing disappointment and a return trip to Burgas. He’s making $15 an hour, stacking boxes, compiling inventory, and developing a social media strategy for Fred and Steven Latasa-Nicks at their well-appointed tavern. In his spare time, he’s playing table tennis, visiting local historical sites, and spending time at the local pier that is much different than the one he’s familiar with in Burgas. And he’s learning something about America that’s been a delightful surprise. Here, he had help from people who are now former strangers. And already he’s learned something about himself. He is one of about 425 international students in Provincetown at work on seasonal jobs this summer, a subset of more than 4,000 across Cape Cod and the islands. It’s part of a cultural exchange, sponsored by the US State Department, in which future leaders of countries like Bulgaria can learn more about our values, more about who are. In return for this rite of passage, we are rewarded as we learn from the rich cultural diversity they offer us. He’ll be here all summer. And he’s coming back next summer.